The National veterinary Institute has won a gold medal award in the 6th National Science, Technology and Innovation competition. The Ministry of Science and Technology has been awarding researchers at national level every year by competing those who engage in the field of problem solving researches that would contribute to become independent of technology and increase product and productivity of the country. Over the past budget year 2008 EC, the Ministry in its 7th National Science Technology and Innovation competition in collaboration with in research and manufacturing institution, National Veterinary Institute has won gold award for its effort in producing animal vaccines. 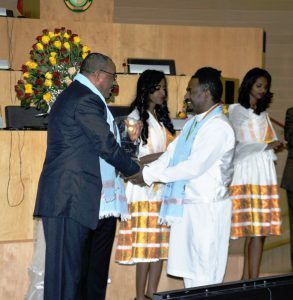 The institute has received the medal from Hailemariam Desalegn, Prime Minister of the Federal Democratic Republic of Ethiopia at a ceremonial held in the African Union hall. One of the key elements that put forward for the award is the production of animal vaccines with quality & quantity based on acceptable technological processes & research works done by Ethiopian professionals of the Institute. Production of veterinary vaccines both in quality and quantity, which helps in averting contagious animal diseases, is also other aspect that abet for the award to prevail. The institute’s contribution in curtailing huge amount of hard currency which the country spending a lot, above all spawning income from the export of veterinary vaccines designated it for the award. In the fiscal year the institute has dispensed 213,496,202 million doses of veterinary vaccines for beneficiaries throughout the country. Generally, the National veterinary Institute has succeeded its public responsibility and accountability which in turn chosen for the annual award. In the preceding year the institute also cherished a silver medal award in 6th National Science Technology and Innovation competition, it was learnt.